It’s been five weeks since Michigan votes decided to legalize recreational marijuana, but Williamston City Manager Corey Schmidt said he does not expect a huge change for community residents. At the City Council meeting on Oct. 22, the last meeting before the midterm election, marijuana was a topic in the discussion. City attorney Timothy Perrone is the person directing the city council on the legality of Proposal 1. Councilman John Bisard asked if there could be zoning ordinances in place to prohibit this [Proposal 1] in Williamston. Attorney Perrone commented there could be a petition brought forward if someone doesn’t agree with the ordinances. However, there was a city council meeting on Nov. 26 which was when the city council voted to either do nothing about the passing of Proposal 1 or make a decision. With the results of the midterm election, Michigan is moving slowly into uncharted marijuana territory with only a few states to guide it forward. It is assumed that smaller communities, like Williamston, should see no change because that is how it went with Colorado and Washington. As for the state as a whole, could it change the view on crimes in communities, specifically small ones which did not have many arrests for marijuana to begin with? According to an MLive article, there were roughly 20,000 marijuana-related arrests. For Ingham County, the largest city by population is Lansing with 110,018 residents, and it had 104 related arrests in 2017. 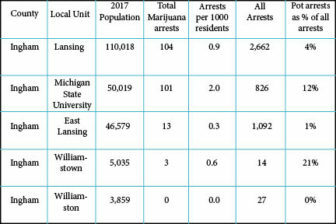 Williamston, the smallest population in Ingham County with 3,895 residents, there were zero marijuana-related arrests in 2017. Within educational institutions, the rules will still stay the same for now. At the collegiate level, MSU still prohibits all marijuana-related activities and alcohol under state and federal law. This might change since the legal age in Proposal 1 is 21 like alcohol. So will this have a big effect on high schools like in small communities like Williamston or on larger college campuses? However, MSU has a chapter of Students for Sensible Drug Policy run by Ebert. This group was in hiatus for a few years and was recently started up and running again in October. SSDP partnered a little bit with the Proposal 1 lobbying groups and worked on some policy changes. Student groups are important because they can help establish new rules or update the old ones. SSDP helped write some of the legislation for Proposal 1. This could later affect the current rules on MSU’s campus which could bleed into smaller communities. As for the smaller community of Williamston, the high school will maintain the rules that are currently in the school district handbook of 2018-2019. High school students tend to be under the age of 21, so they legally will be unable to purchase substances. However, they still have the ability to pay older students for juuls. This is not a new proposition though. Before the presidential election in 2016, lobbyist groups were attempting to get the legalization of marijuana on the ballot. However, not all the signatures needed to make it a formal proposal were made by the deadline. “So folks all kind of regrouped and redid the ballot language, raised the funds to help collect signatures because, for most valid initiatives, it’s a mix of paid people who go out and collect signatures and then that mix of volunteers and so it was, I’d say probably 70 percent of the 260,000 signatures that we collected,” said Josh Hovey, communications director of Coalition to Regulate Marijuana Like Alcohol. This setback helped the grassroots of the campaign grow for this year’s midterm election, which became known as Proposal 1. Within this proposal, it allows the recreational use of marijuana for adults 21 and older. Proposal 1 also allows individuals to own up to 12 plants, a 10-ounce limit kept in residences, requires amounts over 2.5 ounces to be in secured containers, the state has the ability to creating licensing procedures and allows a 10% sales tax. This tax will be used toward education, roads and bridge maintenance. The sales tax will be put on microbusinesses and sales at retailers. The lobbyist group, the Coalition to Regulate Marijuana like Alcohol, is the one who wrote the proposal and submitted it with all of the signatures. The group also worked in tandem with the MILegalize lobbying group. Both groups stated that the rate the proposal passed by was what the had anticipated. According to the polls prior to the election, they predicted that rate would be between 50 percent and 60 percent. The final tally was roughly 56 percent. Despite the official passing of Proposal 1, dispensaries are still under high scrutiny. According to the President of Students for Sensible Drug Policy at MSU, Kat Ebert, several dispensaries in Ingham County, especially the Lansing area have been shut down. The owner of a Lansing seed dispensary declined to comment because of the potential consequences. Within the article, it explains that local municipalities still have the ability to not have marijuana within its borders and the group will still continue to fight for this issue. At the end of the op-ed, Greenlee said that they, being yes voters, may have won but the group will be working to keep Michigan as Healthy and Productive as possible. Proposal 1 sent Michigan into uncharted territory with only a few states to guide the future of marijuana and its policies. It took about two years to fully legalize and accept the new legislation in Colorado. This will most likely be the time frame for Michigan as well according to Ebert and a few dispensaries in the area. Williamston residents without Med cards will still have to wait to go in and purchase but in smaller communities, there should not be a huge change in the atmosphere and environment. What was once a calm Williamston City Council meeting turned into a heated debate within the city hall chambers, pitting the Farmers’ Market Ad Hoc Committee and the Williamston City Council. A “spirited back-and-forth” is how the newly-minted council member Daniel Rhines described it.